1) (London, 1598). Ar. on a cross gu. five mullets (another five estoiles) or, quartering Squire, &c. Crest—Out of a ducal coronet or, a demi lion affrontee arg. Another crest—A lion saliant or. 2) (Paterchurch, co. Pembroke, a.d. 1422). Sa. a martlet ar. 3) (Paterchurch, co. Pembroke, a.d. 1422). Another coat—Quarterly, 1st and 4th, sa. two martlets ar. ; 2nd, sa. five martlets in saltire ar. ; 3rd, sa. a lion ramp. within a bordure engr. or. (See Lewis Dwnn’s Visitation of Wales, a.d. 1591). 4) (Holyland and Loveston, both co. Pembroke, descended from Adams of Paterchurch). Quarterly, 1st and 4th, ar. on a cross gu. five mullets or. ; 2nd and 3rd, sa. a martlet ar. Crest—A martlet ar. Motto—Certior in coelo domus. 5) (Drummer Grange, Hants, Thorpe, Surrey, and Chastleton, Oxon, descended from Adams of Loveston). Or on a cross betw. four martlets sa. five mullets of the field. Crest—A martlet sa. holding in the beak a mullet or. Motto—Cruce Duce. 6) (London, a.d. 1682, from Broseley, Salop). Quarterly, 1st and 4th sa. a martlet ar. ; 2nd, quarterly, ar. and sa. on a cross gu. five mullets or. ; 3rd, per pale az. and sa. three fleur-de-lis or, over all a mullet for difference. Crest—A martlet ar. 7) (Middleton Hall, co. Carmarthen). Ar. on a cross gu. five mullets or. Crest—Out of a ducal coronet or, a demi lion affrontee gu. Motto—Aspire, persevere, and indulge not. 8) (Anstey, co. Warwick, formerly of Northamptonshire, now represented by Henry Cadwallader Adams, of Anstey Hall, Esq.). Vert on a cross or, an estoile sa. Crest—A talbot passant az. bezants collared ar. Motto—Sub cruce veritas. 9) Vert on a cross or, a mullet gu. 10) Arg. on a cross gu. a mullet or. 11) (Longdon, Salop a.d. 1584, 1623 and 1663). Quarterly, 1st and 4th, erm. three cats pass. az. ; 2nd and 3rd, per pale ar. and gu. a chevron between three bees counterchanged, for Mascott, Tasker &c. Crest – (A.D 1584) Issuing out of a ducal coronet a board’s head erect or. Crest (altered in A.D. 1590) A board’s head ar. couped gu. 12) (London, a.d. 1634, Norfolk, a.d. 1664, descended from Wem, Salop). Erm. three cats passant az. Crest—A greyhound’s head erased erm. 13) (Charwelton, co. Northampton, descended from William Adams, Esq. who purchased Charwelton Manor in 1360. The heiress, Selina Anne, daughter of the Rev. Fitzherbert Adams, LL.B. of Charwelton, m. George Wharton Marriott, of the Middle Temple, Esq.). (Welton co. Northampton, a branch of Adams of Charwelton). Erm. three cats-a-mountain in pale az. Crest—A greyhound’s head erased erm. 14) (Owston, Stainsby, East Hardwick and Camblesforth, all in co. York, a.d. 1665, granted 1612 by St. George). Gu. a lion ramp. or, between three escallops ar. on a chief of the last three pallets engr. sa. Crest—A demi griffin erm. winged and beaked az. holding an escallop or. Crest – A demi griffin erm. winged and beaked az. holding an escallop or. 15) (Cheaton and Kaynham, Salop, a.d. 1584, London, 1634). Erm. a fess vaire (in another place checquy) or and sa. between three roses gu. Crest—A griffin’s head erased erm. beaked gu. charged with a chevron chequy or and sa. 16) (Tydd St. Mary, co. Lincoln, 1559 and 1634). Vert a pale arg. between two griffins segreant or. Crest—A griffin’s head couped gu. beaked az. between two wings or, pelletee. Granted 1559, and confirmed 1562. 17) (Middle Temple, 1639). Sa. on a bend or, betw. two bezants three martlets of the field. Crest—On a bezant a demi eagle sa. 18) (Middlesex). Ar. on a bend az. (another, sa.) three trefoils slipped or. 19) (Middlesex). Ar. a fesse betw. four martlets gu. three and one. Crest—An eagle volant reguardant. 20) (St. Ives). Ar. on a chev. sa. three mullets or, pierced gu. 21) (Wales). Az. a crescent betw. three mullets or. 22) Quarterly, erm. and az. in the 2nd and 3rd an eagle rising or. 23) Barry of six or and az. a saltire gu. 24) Barry of six ar. and gu. over all a lion ramp. or. 25) (alias Apadam) (formerly of Charlton,co. Somerset, and afterwards of Fenne, co. Devon, recorded in the Visitation of Devon, 1564). Or, a lion ramp. betw. six cross crosslets sa., quartering Gourney and others. 26) (Brompton, co. Kent, descended from Adams of Devonshire). Or, a lion ramp. betw. eight crosses crosslet fitchee sa. all within a bordure engr. az. 27) (Bowdon, co. Devon, originally of Charlton Adam, co. Somerset). Or, semee of crosses crosslet fitchee sa. a lion ramp. gu. within a bordure engr. of the second. Crest—A dexter arm in armour ppr. embowed, grasping a cross crosslet fitchee sa. charged on the elbow with a torteau. Motto—Libertas et natale solum. 28) (quartered by the late Sir William Adams Rawson, knt. of Putney, Surrey). Per fesse, az. and sa. on a pale betw. two mullets in chief ar. a mullet betw. two crescents of the second. Crest—On a mount vert an eagle, standing the reverse way and reguardant, wings expanded ppr., beak and legs or, holding in the mouth a mullet sa., the sinister claw resting on a crescent, reversed, gold. 29) (Fun. Entry Ireland, 1680). Or, semee of cross crosslets and a lion ramp. sa. 30) (Fun. Ent. of John Adams, son of Randall Adams, Esq. of Ledwichtown co. Westmeath 1669). Vert, a pallet betw. two griffins segreant or. 31) (Francis Ottiwell Adams, Esq., Secretary of Her Brittanic Majesty’s Embassy at Paris). Az. on a fesse engr. betw. two cats-a-mountain passant guardant ar. a like cat-a- mountain of the first. Crest—A cat-a-mountain guardant ar. collared az. resting the dexter fore paw on a terrestrial globe ppr. Motto—Suaviter sed fortiter. 32) (Northlands, co. Cavan). Gu. a heart between three cross crosslets fitchee or. Crest—On a mount vert, a cross crosslet fitchee or, charged with a bleeding heart gu. Motto—In cruce salus. 33) (granted to Thomas Adams, Esq. of Bath). Ar. a cross engr. gu. quarterly pierced and charged with four mullets of the field and in the centre point a mullet of the second and in dexter canton a battle-axe erect sa. Crest—Out of a crown gallery or, a demi lion affrontee ar. semee of mullets gu. 34) (Thos. Adams, Esq. of Nottingham, J.P.). Vert a cross parted and fretty betw. two mullets in the 1st and 4th, and as many cinquefoils in the 2nd and 3rd quarters or. Crest—A talbot sa. semee of cinquefoils or, resting the dexter paw upon a mullet also or. 35) (Francis Ottiwell Adams, Esq., John Street, Berkeley Square, London). Az. on a fesse engr. betw. two cat-a-mountains pass. guard. ar. a like cat-a-mountain of the first. Crest—A cat-a-mountain guard. ar. collared az. resting the dexter forepaw on a terrestrial globe ppr. 36) (Rev. William Cokayne Adams, M.A., Dummer Grange, co. Southampton, eldest son of William Adams, LL.D., of Thorpe, Chertsey, by Hon. Mary Anne Cokayne, his wife, granddau. and co-heiress of Charles, 5th Viscount Cullen). Or, on a cross betw. four martlets sa. five mullets of the field. Crest—A martlet sa. holding in the beak a mullet or. 37) (Drumelton House and Erne View co. Cavan; William Adamson of William Adams. Esq., of Erne View, deceased, and grandson of William Adams, of Gorigommon, co. Fermanagh). Vert, a pale betw. two griffins segreant or, the pale charged in chief with a trefoil slipped of the first. Crest—A griffin’s head couped gu. betw. two wings sa. each charged with three bezants. 38) (Cotswold Grange, Cheltenham, co. Gloucester). Vert, a pale betw. two griffins segreant or, quartering Shute: per chev. sa. and or, in chief two eagles displ. of the last; and Davis: Ar. a chev. betw. three swans sa. Crest—A demi griffin segreant or. Motto—Tout ou rien. 39) (Rev. James Williams Adams, B.A., V.C., Senior Chaplain on the Bengal Ecclesiastical Establishment). Vert a cat-a-mountain betw. three crescents or. Crest—An eagle reguard. wings elevated sa. pendent from the neck an escocheon or, charged with a cat’s face vert, resting the dexter claw on a crescent also or. 40) (Rushton Park, Robertsbridge, co. Sussex; William Adamson, of Macclesfield, co. Chester, m. Margaret, dau. of James Stuart, of Edinburgh, and had a son, William Rushton Adamson, Esq., of Rushton Park, J.P., D.L.). Quarterly, 1st and 4th, ar. a tilting spear broken in three pieces, two in saltire surmounted of the headpiece in pale, pointed or, banded gu. for Adamson; 2nd and 3rd, or, a fesse chequy az. and ar. surmounted of a bend gu. charged with a bezant betw. two buckles gold, in chief a lion pass. guard. of the fourth, for Stuart; impaled with Dakeine: Gu. a lion pass. guard. betw. two mullets or, two flanches ar. each charged with a griffin segreant sa. Crest—A talbot pass. az. bezantee collared or. Motto—Avant. This primarily English and Scottish last name is a baptismal surname meaning “the son of Adam”, from the personal (first name) Adam, a masculine Hebrew given name from ha adamah, meaning “the ground” or “earth”, a name that was popularized throughout the world by the Biblical character Adam, the first person God created. One source states the family first held seat (land and titles) at Kynemund, Annadale. Common spelling variants or names with similar etymologies include Adam, Addams, McAdams, MacAdams, Adames, Adamson, and Addams. The last name Adams ranks 39th in popularity in terms in the United Status as of the 2000 Census. The name ranks particularly high in the following seven states: Georgia, Kentucky, Vermont, Ohio, Maine, Alaska, and New Hampshire. The surname Adams frequency/commonness ranks as follows in the British Isles: England (57th), Scotland (104th), Wales (61st), Ireland (648th) and Northern Ireland (124th). In England, it ranks highest in Northamptonshire and Buckinghamshire. In Scotland, it ranks highest in Kincardineshire. In Wales, it ranks highest in Pembrokeshire. In Ireland, it ranks highest in Cavan. In Northern Ireland, it ranks highest in Antrim. The name is also present throughout the remainder English speaking world: Canada (90th), New Zealand (85th), Australia (67th), and South Africa (43rd). The 1890 book Homes of Family Names by H.B. Guppy, states the following in regard to this surname: “Rare in the eastern and northern counties. In the north, however, its place is sometimes taken by Adamson and Addison, as in the county of Durham. It is at present best represented in Bucks, Devon, Hants, and Staffordshire, and in the counties on the Welsh border, Shropshire and Monmouthshire. This name, according to Lower, was more frequent in the Middle Ages. Adamson is found in the north of England and in the south of Scotland”. The earliest known bearer of this surname was Alianor Adam who was documented in the Assize Rolls of Cheshire in 1281 AD. The Hundred Rolls of 1273 AD, a census of Wales and England, known in Latin as Rotuli Hundredorum lists four bearers of this surname: Juliana Adams (Huntingdonshire), John filius Adam (Oxfordshire), Hugh Adam (Oxfordshire), Germany Adam (Cambridgeshire). The Poll Tax of Yorkshire in 1379 AD lists two bearers of this last name: Johannes Adamson, Johannes Adam, and Thomas Adamson. Early marriages involving this last name include Anne Addams to Thomas Williams in London in 1618, Thomas Adames to Elizabeth Emerson in 1640, and Robert Adams to Jane Stanton at St. Dunstan’s Stepney in 1573. The famous genealogist Bernard Burke’s book “The Landed Gentry” discusses seven branches of this family, discussed below. George-Curtis Adams, Esquire of Antsy Hall in county Warwick was born in 1806 an was a Captain in the Royal Navy and the Justice of the Peace. In 1847, he married Mary-Susan, daughter of Edward Woolmer, and had the following children with her: Henry Cadwallader, Emma Louisa (married Edward Woolcombe), and Katherine Anne. Burke traces the Adams genealogy back to Simon Adam, a merchant who died in 1448 and had several houses and property in London. From him descended Simon Adams, lord of the manor of Great Packham in county Essex who died in 1593. His grandson was also named Simon Adams and he became possessed of Morton Pinkney, county Northampton and he had a son named Reverend Simon Adams in Northampton, who was Rector of Aston-le-Wills. This Reverend had two sons: Simon and Thomas. The later was the ancestor of the Adams family of Lavendon, whereas the former was his heir. This heir, Simon Adams, was Esquire of Daventry and East Haddon who was born in 1667. In 1692, he married Anne, daughter of Reverend William Gilbert, of Culworth, and had two daughters with her as well as a son named Simon. This Simon Adams was a Reverend and Vicar of Welton in Northamptonshire. He was born in 1693 and in 1717, he married Anne, daughter of John Clark, and had two sons. The elder son was Clarke Adams, Esq. of East Haddon and Morton Pinckney, who was born in 1718 and was Lieutenant Colonel of the Militia. He was succeeded by his son Simon, Esquire of Antsy Hall in county Warwick who was Barrister-at-Law and Deputy Recorder. In 1778, he married Sarah, daughter of Cadwallader Coker of Bicester, and he had the following children with her: Henry-Cadwallader, John (Serjeant-at-Law and Assistance Judge of Middlsex, married Eliza Nation and later Jane Martin), and Sarah Coker (married James Beck of Allesley Park). 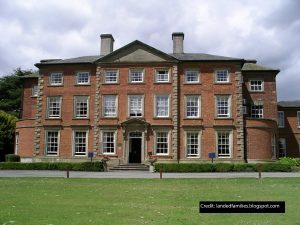 His heir was the eldest son, Henry-Cadwallader Adams, Esquire of Ansty Hall who was born in 1779. In 1803, he married Emma, eldest daughter of Sir William Curtis, and had the following issue with her: Henry William, George Curtis, Frank (Major General who served in East India who married Ellen, widow of J. Straith), Arthur Robarts (Recorded of Birmingham), Cadwallader (Major General of the 49th foot, married Anna Catherine Elizabeth Stopford), Emma Curtis (married John Garrett and George Young), Laura Coker (married Alfred Burton of St. Leonard’s-on-Sea, and Louisa. He was succeeded by his son, Henry William Adams, in 1842. Henry was a Major General in the army and Lieutenant-Colonel born in 1805, who in 1843, married Katherine, his cousin, daughter of Thomas Coker Adams, and had no issue. He was killed in Crimea in 1854. The Adams Coat of Arms is blazoned in heraldry as follows: Vert, a cross or, charged with an estoile sable. Crest: A Talbot passant azure, seme of bezants, and collared argent. Reverend William-Fulford Adams, of Bowdon, county Devon was born in 1833 and was Vicar of Little Faringdon in county Oxford. In 1859, he married Catherine Mary, daughter of Thomas Horton, Esquire of Bromsgrove and had four children with her: William-Dacres, Margaret, Katharine, and Winifred-Mary. Burke traces Adams genealogy or Adams ancestry back to Henry Adams who was born in 1642. He in turn had a son in 1674, also named Henry, who married Susan Tallamy of Bideford, and had a son with her. This son was Reverend Samuel Adams, born in 1693, who married Susan, daughter of Bartholomew Parr. They had a son with her named William Adams born in 1724 and he married Mary, daughter of William Chadder. They had the following issue together: William, Samuel (of Tornes, born 1770, barried Elizabeth Bentall), Mary (married Giles Welsford), Sarah-Chadder (married James Hodge), and Susan (married to John Parr Welsford). His heir was William Adams, Esq. of Bowdon, a Member of Parliament for Totnes who was born in 1752. In 1774, he married Anna Maria, daughter of Richard Dacres, Esquire, and had the following issue with her: William-Dacres, Sir George-Pownoll, Anna Maria (married Baldwin Fulford), and Louisa Sawyer. He was succeeded by his eldest son: William Dacres Adams, Esq. of Bowdon and Sydenham in Kent who was born in 1775. In 1804, he married Elizabeth, daughter of Mayow Wynell-Mayow, and had the following children with her: William Pitt (married Georgiana Emily, daughter of Robert Lukin, and was Consul-General to Peruvian Republic), Dacres, Mayow-Wynell (Justice of the Peace for Kent, born 1808, married Anna Maria Hodge), Reverend Herbert George (Vicar of Cornwood, married Eleanor Fulford), and Elizabeth-Mary. He was succeeded by his eldest surviving son, Reverend Dacres Adams of Bowdon, who was Vicar of Bampton in Oxford, as well as Justice of the Peace. He was born in 1806 and in 1832, he married Anna Maria, daughter of Baldwin Fulford, and they had the following children together: William Fulford and Philip Dacres (married Catherine Margaret Richards and later Jane Newman).The Adams Family Crest is has the following heraldic blazon: Or, a lion rampant, gules, between semee of cross-crosslet fitchee, within a bordure engrailed sable. John-Alexander Philipps, Esquire of Holyland, county Pembroke, Captain of the Royal Army, who was born in 1831, who, in 1869, married Lucy-Ellen, daughter of Edward Loftus Neynoe of county Sligo and harlotte Louisa Saurin, had two children with her: John Loftus (1870) and Bertram Edward (1871). 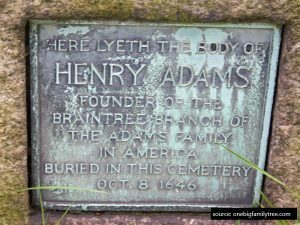 Burke traces the Adams lineage or Adams genealogy and ancestry back through history to a one John Adams of Bucklespool in county Pembroke who, in 1422, married Ellen, heiress of Paterchurch and Holyland, and from this marriage descended William. This William Adams was Esquire of Holyland, son of William, who married Anne, daughter of Joseph Rixson, and had children with her: John Phillipps, Joseph (Major in the army, married Elizabeth Campbell), Roger, and Anne (married Reverend William Thomas and later Matthew Campbell). He was succeeded by his eldest son John Philipps who was a Deputy Lieutenant that married Charlotte, daughter of William Corbett) and they had two sons together: John and William. The elder son, John, was Esquire of Holyland, in 1795, married Sophia, daughter of Archdeacon Holcombe, and left a daughter (Augusta, who married Vaughan Lloyd) and John. John Adams was his heir who was Justice of the Peace and High Sheriff in 1837. In 1796, he married Anne, daughter of Henry Gibbons, and had the following issue with her: John Alexander Philipps, Henry Joseph (married Alice Moore), Augusta Mary (married William Venables), Francis Louisa (married Admiral Sir William Loring), Agnes Anne, and Mary Charlotte. The Adams Coat of Arms is blazoned in heraldry as follows: Quarterly: 1st and 4th, sable a martlet argent; 2nd and 3rd; argent a cross gules, thereon five mullets or. Crest: a martlet argent. Allen Noble Adams, Esquire of Drumelton in county Cavan, was a Lieutenant Colonel in the army, was born in 1822 and served in the Kaffir War. Burke starts this Adams genealogy and lineage with James Adams, Esquire of Monaghan, of Corraneary House, county Cavan who was born in 1673. In 1694, he married Jane, youngest daughter of William and Margaret Allen of Kilmore, and had one son named Allen. Allen Adams, Esquire of Corranearry House was born in 1708 and in around 1735, married Martha, daughter of William Higginbotham. They had the following issue together: Richard, James, and William (of Castletown House who married Oliva Wildridge and had children with her), and Samuel (born 1750, married Elizabeth Leslie and had issue with her), Benjamin (a Reverend and Justice of the Peace of Retreat, see Adams of Northlands). Burke gives pedigrees of each. His heir was the eldest son Richard. This Richard Adams was an Esquire of Shercock in county Cavan, Justice of the Peace, and High Sheriff of Cavan in 1793 and Monaghan in 1785. He was born in 1736 and in 1761, he married Emelia, daughter of Thomas Crosby) and he had the following issue with her: Stuart (Lieutenant 9th and Major Cavan, Justice of the Peace, High Sheriff, married Catherine Leslie), Reverend Allen Noble, James (of Down Lodge, Captain of the Cavan Regiment), Cosby (of Drum, married Dorothea Winslow), William (Lieutenant Cavan Regiment), Joyce (married John Adams, Esq. ), Emelia (born 1772, married Captain Robert Molloy Minnet), Alicia (married Francis Berry), and Jane. He was succeeded by the second son, Reverend Allen Noble Adams who was of Shercock House, was Rector of Shercock, and Justice of the Peace. He was born in 1765 and in 1791, he married Isabella, daughter of John Battersby, Esq. of Lakefield in county Meath. They had children named Richard (of Drumelton, Cavan Captain Regiment), John (Rear Admiral of the White), Stuart, Allen Noble (Ensign in the Glengarry Light Infantry Fencibles), Cosby (of Laurel Lodge, married Catharine Lyster), Reverend James (Rector of Castlecor), Martha (married Smith Berry of Five’s Alley), Sarah (married Robert J. Hautenville), and Emelia (born 1802). Ambrose Going Adams was Esquire of Northlands in county Cavan who was born in 1850. In 1872, he married Anne Jane Foster, daughter of Reverend William W. Deering, and had two daughters with her: Clara Elizabeth Charlotte and Ethel Annie. Burke traces the lineage or ancestry of the family to Reverend Benjamin Adams, son of Allen of Corranearry, who was Rector of Killinick and Justice of the Peace for county Cavan. He was born in 1756 and in 1777 he married Elizabeth, daughter of John Clark, and had four sons and six daughters with her: William Allen (1783), John (Justice of the Peace and High Sheriff for Cavan, married Joyce), Samuel (his heir), Charles James (Lieutenant Colonel in the Royal Navy, Justice of the Peace, married Anne-Jane Foster), Elizabeth, Elizabeth (again), Emelia, Charlotte, Matilda, and Caroline (married John J.A. Leonard of Claremont House). He died in 1840 and was succeeded by his third son Samuel. This Reverend Samuel Adams was of Northlands and was Dean of Cashel, as well as Prebendary of Terebrine. He was a Justice of the Peace for Cavan or Monaghan who was born in 1788. In 1809, he married Frances, daughter of Captain John Hervey, and had children with her: Benjamin William (born 1816), John Hervey, Charles Stuart (of Glynch House, Newbliss, married Eliza McMahonm and later Jane Henrietta Young, and had issue with both), Benjamin William (Reverend, Rector of Santry in the diocese of Dublin, married Georginia Roberts Atkin and later Louisa Jane O’Brien Adams), Dorothea Anne (married Le Chevalier Charles A. Zander on Munich in 1833), Elizabeth Frances (married John J.D. McDonald, Lieutenant), and Caroline Matilda (married Thomas Barry). Reverend Samuel Adams passed away in 1856 and was succeeded his eldest surviving son: John Henry. John Henry Adams was an Esquire of Northlands, Barrister-at-Law, Justice of the Peace, and High Sheriff who was born in 1818. He married Elizabeth Frances, daughter of Ambrose Going of Ballyphilip, in 1846 and had four children with her: Samuel Allen (married Frances Dorothea Preston), Ambrose Going, Margaret Anna (married Ormsby Colville McClintock Jones), and Elizabeth Frances (married Robert Edward Follett Jones). The Adams Family Crest is has the following heraldic blazon: Gules, a heart, between three cross-crosslets fitchee or. Francis Adams was an Esquire of Clifton and Cotswold Grange in county Gloucester who was born in 1812. In 1835, he married Maria, daughter of Reverend Dr. Crossman and had issue with her: Francis (born 1837, married Julia Drummond), Albert Francis (born 1843, 24th foot, married Emma Bell), Frederic Augustus France (born 1846, 2nd Queen’s Royals), George Edward Doveton (born 1851), Lucy Ducarel (married Sir William Adolphus Frankland), Fanny Maria (married Lieutenant Colonel Henry Clark), Catherine Elizabeth, and Mary Isabella (married Henry Edward Surtees of Redworth and Dane End). Burke traces the Adams family genealogy or ancestry to Francis Adams, Esquire of Clifton, county Gloucester, only son and heir of Shute Adams and Francis Freeman. He married Mary Anne, daughter of Stansfield Davis, and had five children with her: Francis (of Clifton and Norton Malreward, Justice of the Peace, Deputy Lieutenant, married Mary Manley), Mary Anne (married J. Morse), Frances (married Robert W. Parsons), Augustus Georgiana (married Edward Morse), and Eliza Freeman. The Adams Family Crest is has the following heraldic blazon: 1st and 4th: vert, a pale azure, between two griffins, sergeant, or; 2nd and 3rd, per chevron sable and or, in chief, two eagles, displayed of the last. Burke begins this Adams genealogy with a mention of William Richard Wallis Goold Adams, an Esquire of Jamesbrook who was born in Cork in 1853. The lineage is traced back to Michael Gold-Adams, son of Wallis Adams and Frances Goold), who in 1800, married Martha, daughter of Simon White of Bantry House, with whom he had the following issue: Richard Wallis, Michael (Lieutenant Colonel in the army, of the Scots Grey), Robert Hedges, Samuel Hamilton (of Salisbury, county Tipperary, Justice of the Peace), and Frances Jane. He died in 1817 and was succeeded by his eldest son: Richard Wallis Goold Adams, an Esquire of Jamesbrook who was Justice of the Peace, as well as a High Sheriff in 1868. In 1802, he married Mary Sarah, daughter of Sir William Wrixton-Becher, and had the following issue with her: William Richard (mentioned at the beginning of this paragraph), Francis Michael, Richard Eyre, Hamilton John, Henry Edward Fane, Edward Eyre, and Arthur Chaloner. He died in 1872 and was succeeded by his son. The Adams family was seated at Jamesbrook, near Cloyne, Ireland. John ap Adam was born in Wales around 1359 AD. He had a son named Roger. Roger was born in Berelon, Gloucester, England in around 1380 and he had a son named Thomas. Thomas Adams was born in Beverston around 1400. Nathaniel Adams was born in England in 1633. He went to America and was the father of Nathaniel Adams. Nathaniel was born in Charleston, MA in 1653 and he had a son named David. David was born in Massachusetts in 1685 and he married Elizabeth Capers, with whom he had a son named David. This David Adams was born in South Carolina and he married Catherine Grimball. He had four issue, one of which was David. David was born in Edisto Island, South Carolina in 1753. He had a son named Benjamin. Benjamin Adams was born in South Carolina in 1780. In Scotland, Duncan Adam was the son of Alexander Adam, who lived during the era of King Robert the Bruce and he had for sons, from whom the Adams, Adamsons, and Adies of Scotland descend. John Adams arrived at New Plymouth in 1621 aboard the Fortune. Joseph Adams, age 16, came to the Barbados in April of 1635 aboard the Paul of London. William Adams, age 16, came to New England aboard the Elizabeth and Anne in May 1635. Richard Adams, a bricklayer, came to New England aboard the Abigall in June 1635, with his wife Suzan. Andrew Adams, age 18, came to Virginia aboard the Transport of London in July 1635. Dorothie Adams, age 24, came to New England aboard the Defense in 1635. Rachell Adams, age 16, came to Virginia aboard the Alice in 1635. Thomas Adams, age 21, came to Virginia aboard the Primose in July 1635. Richard Adams, age 22, came to Virginia aboard the Globe in August 1635. William Adams, age 24, came to Virginia aboard the Thomas in 1635. Raph (Ralph?) Adams was recorded as living in Virginia in 1623. In Canada, one of the earliest bearers was John Adams, a farmer in St. John’s Newfoundland in 1703. In Australia, one of the earliest settlers bearing this name was William Adams, a convict from Middlesex, England who came to New South Wales (a penal colony) in 1820 aboard the Asia. In New Zealand, some of the earliest settlers, who came in 1840, were John and Alex Percy Adams. 1) Quart 1: A stag trippant by a pine tree above a fish naiant, all within a wreath of 13 mullets (Adams — devised by Pres. J. Q. Adams); 2: Sa a less cotised or bet 3 martlets [or?] (Smith); 3: Gu seven mascles, 3, 3, 1 or (Quincy); 4: Gu 6 crosses crosslet fitchée arg 3, 2, 1; On a chief or 3 pellets, the center charged with a fleur-de-lis, those on either side with a lion pass guard (Boylston). Crest: a lion pass guard hold in his dexter paw a cross crosslet fitchée Motto: Fidem libertatem amicitiara retinebis (Tacitus?). Prest. John Quincy Adams bookplate. 2) Arg on a cross gu 5 mullets arg [or?]. Crest: out of a ducal cor a demi- lion [affrontée gu]. Motto: Loyal au mort. Bookplate Adrienne Adams Wickham. J.W.S., sc., 1899. 4) Az a crescent or, on a chief of the 2d 3 fleurs-de-lis of the first. Crest: Issuant from a chaplet of roses gu a demi-leopard ppr holding bet the paws an escallop or. Motto: Veritas liberabit. Grant for Daniel Adams, 1773-1863, of Pleasantville, N. J. Grandfather of Arthur Adams of Trinity College, Hartford. 5) Erm 3 cats pass in pale az. Seal of Thomas Adams of New Kent Co., Va. He was b. about 1730 in New Kent, d. 1788 in Augusta Co. Crozier’s Va. Heral., p. 7. 2) Thomas Adams, Bridgeport, Connecticut, 1864, Granted in London in 1590. Vert, a cross or. 3) Ebenezer Adams, New Kent County, Virginia, 1714. Ermine, three cats passant in pale azure. 4) John Seeley Adams, Esq., Syracuse, New York. The arms of Robert Seeley, Watertown, MA. Sable a lion rampant or betwee two flaunches argent. Crest: A lion rampant or. 5) Mrs. John De La Mater Adams, Syracuse, New York. The arms of Robert Seeley, Watertown, MA. Sable a lion rampant or between two flaunches argent. Crest: A lion rampant or. We have 40 coats of arms for the London surname depicted here. These 40 blazons are from Bernard Burke’s book The General Armory of England, Ireland, and Scotland, which was published in 1848. The bottom of this page contains the blazons, and in many instances contains some historical, geographical, and genealogical about where coat of arms was found and who bore it. There are hundreds of notable people with the Adams surname. This page will mention a handful. Famous people with this last name include: 1) John Adams (1735-1826) who was an American patriot, Founding Father, signer of the declaration of independence, and second president of the United States, 2) John Quincy Adams (1767-1848) who was an American statesmen and diplomat who was a Senator, member of the House of Representatives, and 6th President of the United States, 3) Samuel Adams (1722-1803) who was an American statesmen, Founding Father, Governor of Massachussetts, and political philosopher who shaped the ideals of the American Revolution, 4) Brock Adams (1927-2004) who was an American politician who became a United States Senator from Washington, 5) Judith Anne Adams (1943-2012) who was a New Zealand-born Australian Senator, 6) Bryan Guy Adams (1959) who is a singer, songwriter from Ontario Canada whose hits include Summer of 69 and Run to You, 7) Ansel Easton Adams (1902-1984) who was an American photographer and environmentalist known for his photographs of the American West, 8) Ryan Adams (1974) who is an American singer-songwriter from Jacksonville, North Carolina, 9) Amy Lou Adams (1974) who is an American actress known for her roles in Catch Me If You Can, Doubt, American Hustle, and Enchanted, 10) Charles Francis Adams Jr. (1835-1915) who was a colonel in the Union Army during the American Civil War and later the president of the Union Pacific Railroad, 11) Charles Francis Adams IV (1910-1999) who was a United States Naval Officer and electronics industrialist who was the president of Raytheon from 1948-1960, 12) Weaver Warren Adams (1901-1963) who was an American chess master and opening theoretician who won the U.S. Open Championship in 1948, 13) William Adams (1564-1620) who was an English navigator born in Gillingham Kent who was the first of his country to reach Japan, and 14) Charles Francis Adams (1876-1947) who was an American sports promoter and businessmen who founded the Boston Bruins. The two most common heraldic symbols in the Adams Coat of Arms (erroneously called the Adams Family Crest) are the cross and mullet (star). No other symbol appearing in heraldry is subject to as much variation as the cross. Mediaeval Europe was a deeply religious and Christian and many of the nobility wanted to show their devotion by adopting the symbol of the cross as part of the arms. In its basic form, the cross is created from two broad bands of colour at right angles covering the whole extent of the shield. It has been subject to all manner of embellishment, and the interested reader is referred to the references, especially Parker’s Heraldic dictionary for many examples of these. Suffice it to say that any armiger would be proud to have such an important device as part of their arms. There is a thick book “The Genealogical History of Henry Adams” (loc. Albuquerque NM Univ. ), who sailed to Baintree MA about May of 1634 AD, with eight sons and one daughter. He and his firstborn, Joseph, have tombstones in Baintree (Quincy) MA, and Joseph is Great-grandfather of Pres. John Adams. History was gathered and methodically published of all nine progeny down to 1897, by Nathaniel Adams. My Great-grandfather Daniel Kingsbury Adams, is my link as an eleventh generation, with three generations after me, ao 2018 AD. Two descendants in the 1700’s went back to England to trace ancestry, found none, except over in Wales, including Coat of Arms, but little details given. My ancestors mainly spread from New England across northern half of the lower 48 states in the past 384 years since Baintree MA. My Family comes from the “Forest of Dean” in Wales My Great Grandfather was Thomas Adams the Father of William Hedley (my grandfather). I am Robert Gordon Adams, Son of Gordon Lloyd, I still cannot connect my family further than William henry, is it possible for someone to chase this further or connect me from there onwards? 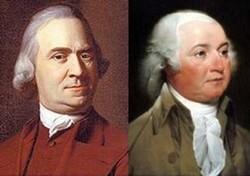 I am the Great-Great-Great-Grandson of John Adams, 2 President of the United States.